A three digit contact less digital tachometer using 8051 microcontroller which can be used for measuring the revolutions/second of a rotating wheel, disc, shaft or anything like that is introduced in this project. The tachometer Â can measure up to a maximum of 255 rev/sec at an accuracy of 1 rev/sec. What you just need to do is to align the sensor close to the reflective strip Â (aluminium foil, white paper or some thing like that) glued on the rotating surface and the meter shows the rev/sec on the display. The circuit diagram of the digital tachometer is shown below. From the above two graphs you can see that the negative going edge of the waveform indicates the passage of the reflective patch across the sensor and that means one revolution. If you could some how measure the number of negative going edgesÂ occurringÂ in one second, then that’s the rev/sec of the rotating object and that’s what the microcontroller does here. 1) Â Count the number of negative going pulses available at its T1 pin (pin15). 1) The LUT used here was made for a common cathode seven segment display (used in previous projects) and here we are using a common anode display. The instruction CPL A will just complement the digit drive pattern in accumulator so that it becomes suitable for the common anode display. This is done just because to save my time but not a text book method. The correct way is to make a dedicated LUT for common anode configuration and aviod the extra CPL A instruction. 2) LM324 is a quad opamp and only one opamp inside it is used here. I used LM324 just because that was the only single supply opamp with me at the time. You can use any single supply opamp that matches our supply voltage(5V). You can even use a dual supply opamp (like the popular 741) in single supply mode (+V pin connected to positive supply and -V pin connected to ground) but i wont recommend it unless you have an oscilloscope. Dual supply opamps configured in single supply mode will not give results like a dedicated single supply opamp in the same situation. 3) As we saw earlier the Timer 0 which generates the 1 second time span is configured in Mode 1 (16 bit timer). So the maximum it can count is 2^16 and that isÂ 65536. In 8051 the crystal frequency is divided by 12 using an internal network before applying it as a clock for the timer. That means the timer will increment by one for every 1/12th of the crystal frequency. For an 8051 system clocked with a 12MHz crystal the time taken for one timer increment will be 1ÂµS (ie; 1/12MHz). So the maximum time delay that can be obtained using one session of the timer will be 65536ÂµS and it is looped 14 times to get the 1 second delay. 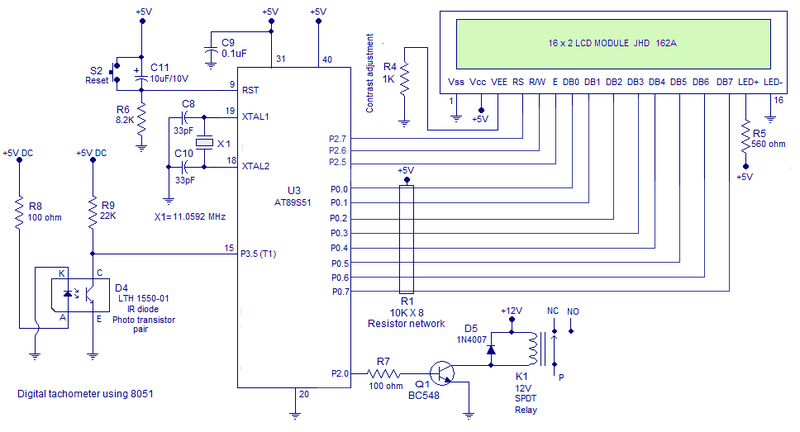 Go through this article Delay using 8051 timer for a better grasp. 4) Also read this article Interfacing seven segment display to 8051 before attempting this project. LCD version of the tachometer using 8051. This is just aÂ modificationÂ of the above digital tachometer using 8051. A 16×2 LCD module is used here for displaying the output. The output is given in rpm (revolutions per minute) and the number of digits are increased from 3 to 5. This circuit can display up to 10200Â rpm and it is more accurate than the LED version. Also, there is a change in the sensor circuit. A photo transistor/IR diode pair (LTH-1550) is used for sensing the rpm instead of the discrete photo transistor, LED combination. The usage of LTH-1550 photo interrupter module makes it more rugged and stable. Visual light interference is minimized because the LTH-1550 senses IR only. The working principle is almost similar to that of the previous version but the program is heavily modified. The circuit diagram of the LCD tachometer using 8051 is given below. A simple 12V, 5V/1A Â power supply circuitÂ based on voltage regulator ICs 7805 and 7812 is given below. Program for the LCD tachometer. The program actually counts the number of negative going pulses in 1.5 seconds and it is multiplied by 40 to get the number of revolutions per minute. what is the purpose of relay in the lcd version and where is it connected to? what is the purpose of relay? Can you Provide an lcd version of it please! i have posted the LCD version below the main article. pls have a look. Can this circuit be purchased on this site? I’ve got this working and it’s really great but I would like to know if it is possible to have the 7 segment displays to display the speed constantly on rather than them to be flashing. do you have layout of this project? We are working on the layout part! Will be updated on this page. Hey, Can you tell me how much space have you given between the LED & the phototransistor for the proper calibration of the Output.!! If possible would u please furnish me with the PCB layout of the circuit of tachometer using 8051 given. I’m looking forward to realize the circuit provided and therefore would be easier for me to move ahead with the project if the layout is available with you. did you get the things you asked for? hi , i have a trouble with the timer.. i don’t really know whether my circuit works or not. my project is to connect this project to LCD 16×2..
i can send you my circuit and my code in .rar so can you help me? Thanks a lot for the Originators. What is the use of burner circuit of 8051 microcontroller in this device? -can you give me an alternative proggram for an arduino board with respective connection? -Programming language used is C-Assembly level language. You an use Keil to code, compile and test the program code. -IC 2 is your 8051 series u-controller(micro) it is easily available in the market both online and offline. I bought a fresh u-controller from a local electrical components store for a $(without dumper). -Read the datasheet that came with your display to learn which pin is what. For this setup and every other setup based on principle of reflection of light the IR LED and the photo-sensor are placed side-by-side at a distance of 2-3mm from each other facing the obstruction which is generally less than 10cm away from the tip of IR LED. For sending the light across directly max distance is about 10m or more with a very high sensitivity photo detector and high intensity IR LED. But this distance varies according to the climatic conditions in the region and also other devices operating in the area. Military uses high grade IR sensors that are able to operate for distances of few 10Km to 100Km. For project purpose of measurement a distance below 1meter is suitable, but higher distances are possible if sensors are properly calibrated. T.V & A.C remotes use IR sensors to operate. I have tested my T.V remote to operate properly from distance of 5m at the most, on a sunny day with average temperature of 303 Kelvin. You have to test and calibrate your sensors based on application. I’d like to install a disk and to do a small hole in the disk (It is for get the speed in a small lathe).- The disk will be installed in the Lathe’s shaft and in the back the Red Light.- I wish to have an idea about the distance between the Photo- Transistor and the light.- The second thing is about the color of the Led (RED) is it in relation with the frequency of the Red Light? Plz. Can you feed me thw same circuit with high sensitivity . Can u explain me How. Excellent job. Just one question. What you use to program the 8051? Any special interface cable? Thanks. I use an In system programmer (ISP) module for programming the 8051. The user interface for programming the microcontroller comes with the ISP module. The module is connected to the PC through serial port. For creating hex file I use MIDE-51 compiler. Kindly provide C code for better understanding. We will try to bring up a “”C” code in near future. both C code and assembly level program should be provided for these kind of interfacing… It really helps a lot.